A plaza two blocks from the White House is being envisioned as a Tahrir Square or Madison, Wisconsin – a place for ongoing, nonviolent citizen protest – under plans by a coalition of activist organizations and prominent individuals. Their demand: withdrawal of all “U.S. troops, contractors or mercenaries” from Afghanistan. Organizers have begun an online campaign to solicit endorsements from groups and pledges from at least 50,000 individuals to say they would be willing to come to the nation’s capital beginning Oct. 6 – a Thursday and the 10th anniversary of the start of the war in Afghanistan. One of the organizers, single-payer healthcare advocate and pediatrician Dr. Margaret Flowers, told Nieman Watchdog that the group hopes for “a sustained occupation of the square beginning on the 6th of October.” The location, Freedom Plaza, is on Pennsylvania Avenue, N.W., within marching distance of the Capitol and other federal offices. On the first day of the posting for the October action, she said, hundreds of people signed up. The number of organizations endorsing the event stands at 25 as of this writing, with many more expected as these groups go through their endorsement processes. 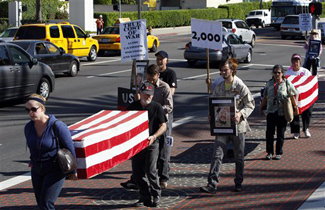 In announcing the call for the action, organizers said they believed a tipping point has been reached in the American people’s disgust with “the atrocities of U.S. foreign and military policy” and “a U.S. domestic policy that steals from the people to add to the already hideously bursting pockets of the wealthy.” The time is ripe, they said, for a Tahrir Square-style outpouring. “When the tipping point is reached, it seems at once both unexpected and completely obvious. We are nearing that tipping point in the United States. We have witnessed the Arab Spring and the blossoming of the European Summer. We ask ourselves if now we will experience the American Autumn,” wrote organizers Flowers, Kevin Zeese (head of Come Home America and ItsOurEconomy.us), Tarak Kauff (Veterans for Peace) and Elaine Brower (a military mother and a leader of the antiwar group World Can’t Wait) in announcing the action. Swanson said he would “be delighted to be proved wrong” about the mainstream media, but he said “the majority positions of Americans on ending wars, taxing corporations and billionaires, providing healthcare and safe retirement, investing in education and jobs and clean energy, and so forth, are routinely ignored and belittled” by major news organizations. Kevin Zeese echoed Swanson’s critique, indicating activists’ general distrust of major news organizations and increasing reliance on online alternative media to spread and report their message. Major news organizations do indeed ignore antiwar events. It’s understandable that the big media outlets can’t cover every protest, especially in Washington, D.C., where there are so many – but by ignoring antiwar protests almost totally, editors are treating opposition to the war much as they handled the run-up to the war in Iraq: they are missing an important story and contributing to the perception that there is no visible opposition to the Afghanistan war – even as polls show overwhelming support for a U.S. military withdrawal. Our own research confirmed what Lindorff wrote at the time: “It was blacked out of the New York Times...the Philadelphia Inquirer...the Los Angeles Times..the Wall Street Journal...and even blacked out of the capital’s local daily, the Washington Post.” NPR gave it 143 words, and USA Today 74 words. Using videos and text, the protest – including the arrests, interviews of veterans as to why they were planning to be arrested, as well as excerpts from speeches by participants – was covered by nontraditional media: The Huffington Post , the Socialist Worker, OpEd News, Salem-News.com in Oregon, and...the Sydney (Australia) Morning Herald. The Washington Post ran a wire service photo of Daniel Ellsberg inside the Metro section with the cutline that he and “several others” were arrested for not dispersing. When some readers complained to Post ombudsman Andrew Alexander about the lack of coverage, he checked with the U.S. Park Service and learned that the 131 arrests was the biggest mass arrest of the year for park police – another newsworthy factor. Alexander allowed as how 131 arrests “warrant more than an inaccurate cutline” but also revealingly stated what would seem to be a common newsroom attitude: “Staged events with mass arrests don’t necessarily have high news value.” As if other large rallies just break out spontaneously without any planning. “Happily,” Zeese continued, “more and more Americans do not trust the media” and rely instead for news on “independent media sources telling the truth,” detracting from what he called “the corporate media’s credibility.” There is also the possibility that a successful action at Freedom Plaza could attract overseas media attention. The online pledge to attend the Freedom Plaza protest reads, in part: “I pledge that if any U.S. troops, contractors, or mercenaries remain in Afghanistan on Thursday, October 6, 2011, as that criminal occupation goes into its 11th year, I will commit to being in Freedom Plaza in Washington, D.C., with others on that day with the intention of making it our Tahrir Square, our Madison, Wisconsin, where we will nonviolently resist the corporate machine until our resources are invested in human needs and environmental protection instead of war and exploitation...” President Obama has indicated a goal of a 2014 full withdrawal date, if Afghan security forces are ready to take over from U.S. and NATO troops then. Among the other initial signers in support of the pledge are Cornel West (author and professor of African American studies and religion, Princeton University); radio and television political show host Thom Hartmann; Rabbi Michael Lerner (editor, Tikkun Magazine); Glen Ford (executive editor, Black Agenda Report); former FBI agent and whistleblower Coleen Rowley (a Time magazine co-person-of-the-year in 2002); noted civil rights and civil liberties attorney Bill Quigley; former New York Times war correspondent and Pulitzer Prize winner Chris Hedges; retired colonel, State Department diplomat and activist Ann Wright; Matthew Rothschild (editor, The Progressive magazine); former CIA analyst Ray McGovern; the antiwar group Code Pink cofounder Medea Benjamin; longtime peace activist Kathy Kelly (co-founder, Voices for Creative Nonviolence); military mother Elaine Brower (a leader of the antiwar group World Can’t Wait); and prominent Washington, D.C. activist and religious leader, the Rev. Graylan Hagler (Plymouth Congregational United Church of Christ). Initial organizations supporting the action include the major antiwar group the ANSWER Coalition, Veterans for Peace, United National Antiwar Committee, Single Payer Action, Code Pink, Voices for Creative Nonviolence, the Green Party, firedoglake, World Can’t Wait, National Campaign for Nonviolent Resistance, Black Agenda Report, War Is A Crime, Network of Spiritual Progressives, Tikkun, and Pax Christi Metro DC-Baltimore, among others. Editor's note: Some content in this report may be offensive to readers. For more on this CNN exclusive story, watch Kyra Phillips' full report on "The Situation Room With Wolf Blitzer" tonight starting at 5 p.m. ET. War will not come to an end untill Bush and his cronies are tried as war criminals. They are responsible for more than 5000 US soldiers' murder who were sent to wars based on 800+ lies of Bush. They also are responsible personnaly for murdering hundreds of thousands of Iraqi and Afghani nationals and property destruction. They also misappropriated billions of US taxpayers' dollars causing death and destruction. Their families and friends knowingly supported Bush lies - they are also to be brought to justice. Until they are brought to justice others would follow their path and wars will continue. As long as there is no draft, the majority of Americans will not protest or otherwise take action to end the military's involvement in Afghanistan, Iraq, Libya, or elsewhere. If the organizers want to stage a demonstration that attracts lots of people and lots of media attention, they should start another "Hooverville" and focus attention on the plight of the unemployed.